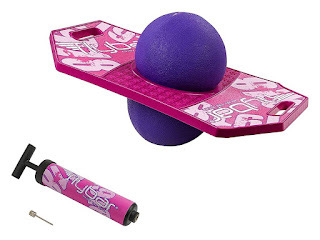 Today only, while supplies last, Amazon Prime Members can get this Flybar Pogo Ball Trick Board With Grip Tape and Ball Pump for ONLY $18.99 (Retail $27.99)! STRONG CUSTOM DECK- The Flybar Pogo Trick Board is made of a thick ABS plastic with custom Flybar graphics that is durable and tough to handle extreme tricks and prevent cracking. CUSTOM GRIP TAPE- Each Flybar Pogo Ball has custom grip tape that will give you ultimate control and balance. Each color comes with a different awesome grip tape design that will be sure to stand out. EASILY PORTABLE WITH CARRY HANDLES- Carry your Flybar Pogo Ball Trick Board anywhere with the convenient carry handles on each side of the board. They can even be used for tricks. THICK AND DURABLE BOUNCE BALL- The bounce ball easily and snuggly fits within the trick board. Make sure the "Flybar" logo is facing up and as your blow up the ball, have the lip of the ball go underneath the board for a tight fit. The bounce ball is made of strong, durable materials capable of handling weights up to 160 pounds. COMES IN 5 AWESOME COLORS: With options like green, purple, pink, orange, and blue, there's a Flybar Pogo Ball for everyone. For ages 6 and up.